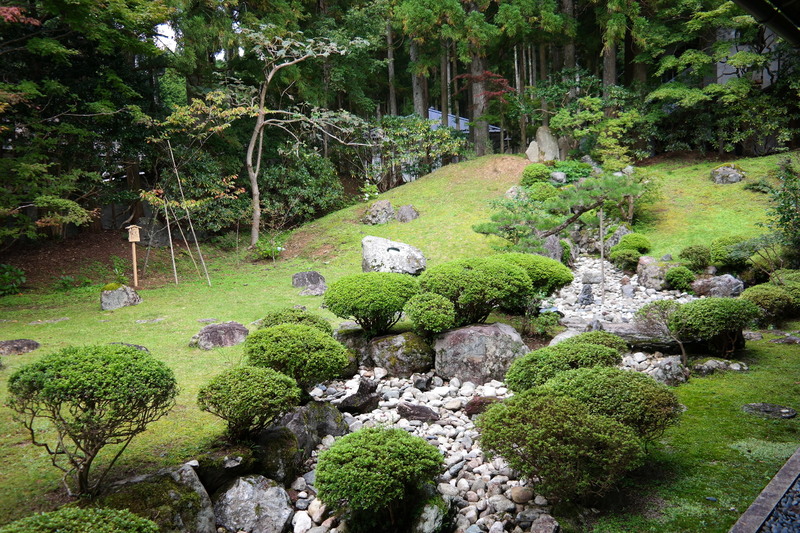 Koyasan is a real Buddhist centre: there are 117 temples. The founder Kukai (774 – 835), also known with his posthume title Kobo Daishi, is so beloved because his teachings promise to achieve enlightenment in one’s lifetime. A really good place to interview a Buddhist monk on Quality of Life. The challenge is to find someone speaking English well enough. 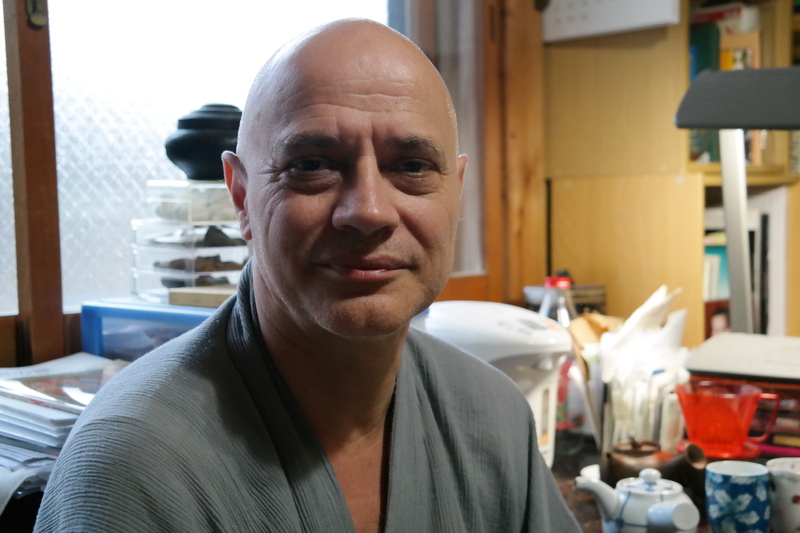 The Buddist information centre suggests me to interview Buddhist priest Kurt Kübli Gensō of the temple Muryōko-in. He speaks fluently English (among other languages) and comes originally from Switzerland. So I went to the temple Muryōko-in. Although he is very busy, he is so friendly to do the interview right away. After a short tour through the wonderful temple complex which also provides accommodation for visitors, we settle in his working room. My goal is to find out what a good quality of life is, for myself and others, and of course you know much better what a good quality of life is than we do. Well, I don’t know. Good life, quality of life,… I would say it is a taste. How you feel what is a good life. We cannot discuss about taste. Some think the life is a good life when you have a car, house, wife, children, whatever you think. Maybe that is for many people the standard. I don’t know what is good really. Buddhism is beyond good and bad. Today we think we need all this stuff and one day we make an experience that we don’t need this stuff. And then we think this one is good; before we thought the other one is good. And when you always live without anything, maybe you think it would be convenient to have a bed or a chair. So, it is not stable. The values that we give to something is not stable. So, how do you think we can live? I have no better. We live how we have to live. That is a little bit a cosmic life. It is not how we think. Sometimes we think it is this way. Then there comes an earthquake or a tsunami and it takes of everything. And then we see, oh, that was not the right way. Buddhist teachings would say: non attachment. If you are not attached to anything: every second is a perfect second in your life. If you have not an image of what it should look like then you always have a good life. Buddhist teachings say you have to learn to live in the present. Every second where you are fully conscious, fully aware and mindful then you establish eternal happiness. The Buddhist way of thinking is a way we can learn. It is not a western of eastern way of thinking. It is not a cultural thinking. It is a universal truth. A thinking that we can learn. Once you experience these different levels and you will see how you project some image of perfection. When it is equal you feel happy or think it is true. But when it not equal to what I projected to the world, what I receive, then maybe I am not happy when it is on the negative side from that what I think is correct. Or when it is better than I thought, then I think ok it is better. And then I am more happy. But the happiness must have an equal state, not extreme up and not extreme down. How can I establish happy moments? How does happiness comes to me as a feeling? That’s when I am united with body, voice and mind. When this is united in what you are doing and what you are saying and what you are thinking. If you take a telephone and you do something else with your fingers, or with your mouse, then you are separated. The ideal state of life can be a pilgrim who walks continuously (HB: Koyasan is a starting place of the famous pilgrim routes in Japan). The monk is basically a homeless. He walks. The monk in Theravada Buddhism walks, he is not fixed to a place – only in rainy season when he goes back to his home temple -, otherwise he walks and every path he walks is establishing happiness. If he is mindful. And then he has a good life? The good life or the bad life is gone. Because you are living. Do not think Western or Asian people are different. Because human beings are thinking in the same way. There is no difference between a westerner and an easterner. The language is different, the cultural expression is different. But the inside of our way of thinking, feeling, interpreting, mental activities are for all human being the same. You can go to Africa, America, Australia, China, wherever you want, you will always find human beings thinking etc the same way. And for this reason, the Buddhist teaching has an universal value. It is not a religion where you have to believe, but where you have to verify your mental attitude to the reality. That’s Buddhism. Is it still possible to have goals? Of course, you can have goals. You can have wishes. But this is losing time. You don’t know what comes in the future. You can project, you can make plans. But as I said, one day there comes an earthquake and all is gone. You have to find happiness in this real moment when you are living. When you are living consciously, mindfully then you establish immediately happiness. So, what you are going to do about the future and are thinking about the past. The past is gone and the future may come or maybe not. It was to create a good life and now it is to be aware? If you are going to think about your life: that is not your life. You have to live the life. So, I better do not do this project? No, you can collect the craziness of the people. What they think. Then, you will see people think life. But life is to live, not to think. That’s the most important message? To live life. Not to think life. Here in this area Koyasan, Kukai made his tremendous promise to the people to get enlightenment in one life, in this real body, that would be a tremendous improvement in one’s life, for one’s quality of life. It doesn’t matter if you come to Koyason, or others, all Buddhist teachings have the same teaching. And when you study the text very clearly and then you understand it refers to the one second in the life now, in this moment. How can you speak of enlightenment when you are dead, when your body is not functioning. So you need the body to put the Buddhist teaching in practice. The Buddhist teaching is: live in the present. If Kukai says this in this way or another Theravada monk in this way: it is always the same. It doesn’t change. The words change, the pictures, the method, … the essential teaching is to live your life, mind, voice, body united with the universe. So with the metaphor of the walking pilgrim,… when you walk you forget everything. You don’t know more considering. Seems so important. Generally, people think it is important. It is important that you do not fall down on the street when you walk. You must also take your rest. When you are tired you sit down. When you are sitting and relaxed and you think it is now possible to walk and then you walk. When you sleep, you sleep. When you think I should sleep, and I don’t sleep, then I get stress. And then I become sick. And then I may die and then it is finished. For this moment. Is it easier for someone to walk to be aware, to be in the moment. Than for someone in the normal life? Walking meditation, not necessarily a pilgrimage… I have a friend who is a philosopher and alpinist and he says that when he goes out in the mountains, mountain climbing, I must be one with my action. If I am not one, I will fall down. That’s it. He said that’s for him like a meditation. Another gentleman who also took the first part of the ordination rite as a monk: I feel perfectly when I’m surfing. I am one with my surfing board, with the wind, with my body, this is my meditation. So, that’s really a recreation of the mind to come into the present. If you are surfing or skiing and are not mentally present in what you are doing, you fall down. If I work and think I would like to serve.. then I have stress. But if I work because I feel working then I work. Then I am happy. So the people who get sick, who get cancer, often have a problem. They don’t like this, they don’t like that. Maybe also other causes, biological. Can you say something about yourself, personally? There is no more self once you are one. You lose yourself. And don’t know what you think is interesting about me. Well, as an example for other persons. I try to practice. Be one. That when we understand very clearly the Buddhist teaching, or Mahayana teaching, the fact of this oneness, then maybe we start to teach, or somebody asks what is good life, then we can speak form this point of view. Maybe it is useful, maybe not. We do not judge about the value of what you say but the encounter creates the dialogue. So what is manifested in this form is manifested in this form. Even if there are wrong insights, maybe, it is perfect for the moment. So we do not look for a perfection or way that is idealistic. Everything what is created in this second is perfect in itself. In the dialogue, it is the interaction that is important? If you make a question: there are two ways to answer your question. I enter in your system of thoughts then my answer is conditioned by your question and by your way of thinking. So, I can say yes, no, maybe yes or something like this. Or… I say something totally different. Then, I don’t answer your questions but we can have a dialogue. That’s the zen dialogue. You ask ‘Can I reach enlightenment?’ Then the teacher may say ‘Eat spaghetti’. So, you say ‘Uhh, what has it to do?’ They come together in this real moment. So one is about enlightenment, one is about spaghetti. Fine. It is perfect as it happens in this real moment. It is not good, it is not bad. It is there what happens. You can, on the relative way, evaluate. But what is the meaning? If there is a river you want to build a bridge. That’s not bad. That’s convenient. But you can also go by your boat. For example, I have now to do a work about tourism for a seminar. Shall Koyasan be promoted for tourist activities and bring tourists here? There are different views here. On one side, we don’t need tourism. On the other side, there are so many tourists here and when they go home they are pilgrims. Because this place touches your heart. If the mountain (HB the Koyasan area) wants to survive: the people of Koyasan needs pilgrims, tourists, etc. who pay something. They are followers of the Shingon school and bring money to the mountain. But if they don’t come how can the mountain survive? This critical economic situation: they had it many times in the Koyasan history. They had no income, they had no food. So they left the mountain. There is a relative truth but when you ask me for a good life then I tell you: you have to learn to live in the present. Every second is good. Every second is bad. That means all are perfect. The bad and good are only existing because the one word good is here and then comes the other word that is bad. The contrary. Both are existing in the world, in the universe. And it is only how we look at the subject, that’s important. I also go to Sweden to meet Professor Robert Erikson who worked with the United Nations. And I am also going to ask him about Quality of Life. Do you have a question for him? I have no question. What shall I ask? There is nothing to question. There is only to live. People have a lot of questions. I have no questions. But it is also good to have questions like you said. Interview. I am a media star for Japan. They like to make interviews. Media star. I didn’t look for this job. They made me into a media star. I appear every week on television. They like me. I like them. I understand, you have a kind of pleasantness with a sharp mind. And you make me laugh. Today or tomorrow comes the television for a new interview. For a long interview. As long as I can I do it. I don’t know if it helps. It helps them to fill the program and to keep the people busy. I don’t look television. So, if I appear 5 minutes or 10 minutes or 30 minutes, somebody speaks serious stuff… even joking. You have a good kind of humour. I don’t say good or bad. Of course (HB once again I fell in the trap of good and bad). You have still this present. Once you understand, once you really understand – you say you practice zazen (HB zen meditation) – once you really understand the mechanism of our mind you will give up this stuff, it is not useful. Somebody makes bad things. I sponsor students (HB in Laos). I help poor students. Now, I have three students who make trouble. One started with the big trouble. He was the administrator of money which I sponsor. He should give every month the people the money. Because to send for each the money costs me 50 dollar each one. Now, he used this to enjoy his girl. Drinking beer and go to parties and so on. So, 500 – 600 dollar away. For a country where many people earn if it comes good 100 dollar per month. So, shall I be angry? No. I cannot be angry. I am to laugh and say a standard story. I only can have compassion. Poor boy. That he does not understand. But, there comes the relative truth. How, can I protect money which is not sought to invest in beer, but to invest in education. Can I think relatively and think may be better I do it the other way. That’s the relative truth. It helps… I don’t know, there is no absolute truth. Have an earthquake, have something and everything is gone. What you can. The monk knows what causes the next cause. Because you know what is karma. Everything conditions the next. Everything in the world is conditioned. Our mind. Our body. The moon. Whatever you have is under a condition. There is nothing which is free from something else. Interconnected. Interrelated. The self and the mine. Each conditioned by each other. That’s the concept. You have to see it. So, I don’t think he did bad. For he did good things. I know that conditions brought to this condition. To which point you can practice compassion remains a question. You will have compassion for this people. But you have to protect themselves in the interest of other people. That’s what we say is a wise action. From experience. Wise.